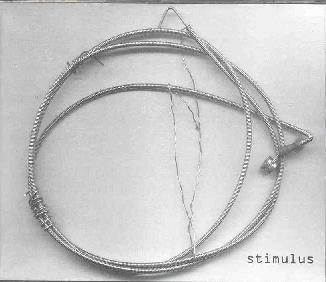 Stimulus - "A Motion Signal"
A British trio, I don't have much info on Stimulus or its members, but they have a large number of releases that seem to date back to 1996. Instrumentation includes piano, guitar, drums, drum machine, violin, cymbal, tape machine, sampler, synthesizer, sequencer, effects, and other miscellaneous gear. A simplistic description of the music would be space ambient, but there are various experimental, psychedelic, and progressive influences too, and loads of contrasting sounds and styles that Stimulus combine which make this an interesting and enjoyable album. "Inertia" opens the set with pulsating textures of various frequencies, looped bits, and slow sombre piano melodies. The space patterns tend to have a repetitive minimalist quality though the multiple parallel patterns develop steadily as the music progresses. It's all very peacefully melodic yet the space loops give the music a psychedelic edge as well. "Sporadic Irregularity" includes similar electronics but with a bit of a drum ‘n bass rhythmic slant. I'm quickly figuring out that these guys excel at layering electronic patterns that straddle the line between spaced psychedelia and experimental music. Venturing into somewhat different territory is "In The Interactive Alien Disco" which consists of spacey electronic prog rock with a Vangelis/Tangerine Dream/Synergy feel, but with a robotic electro dance beat and embellished by the freakier sounds that I'm getting accustomed to from Stimulus. Actually this reminds me of the Descent computer game theme. "Momentum" is a 17 minute, slowly developing ambient track that is somewhat similar to Alien Disco in that it has the dance beats, though here it's more of a drugged drum ‘n bass style. There's also traces of Tangerine Dream and Synergy, though Stimulus have carved out an interesting and appealing netherworld spot between space/ambient/progressive and more experimental minimalist electronica. The piano melody that gave such a haunting atmosphere to "Inertia" returns on "Setting Moods For Sending Information". Here it's accompanied by strange radio signals and trippy loops that loom in the background. The music again develops very slowly, like a ghostly chamber performance from some psychedelic spirit world. But there are also some moments of pure cosmic space that utilize synth sounds we've all heard before, but combine nicely with other patterns and textures that make for an interesting contrast. Another track worthy of mention is "Mirrored Ages", an ambient space tune with an industrial feel. Dark mechanical howlings and drones dominate, yet there's also a Celtic whistle playing a merry tune. Strange but captivating. Overall, an intriguing set that I was easily lost in. But there's also plenty of elusive details that reveal themselves with subsequent listens. For more information and lots of mp3's you can visit the Stimulus web site at: http://www.stimulus.st/. A Motion Signal and other Stimulus releases is distributed by Beta-Lactam Ring Records. You can visit their web site at: http://www.blrrecords.com/.